Steve and Anne Millington have worked and played together as Sacramento’s Millington Strings since their marriage in 1990. Steve is founder and manager of Millington Strings. He received his Master’s in Cello Performance at CSUS in 1997, studying with Andrew Luchansky. 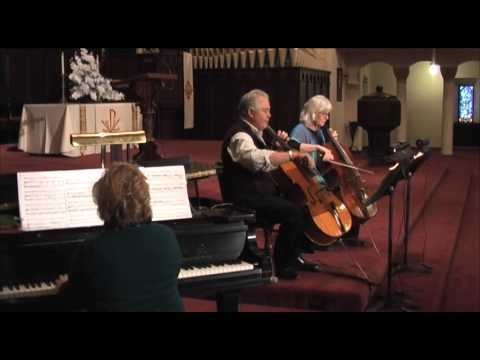 Playing credits include principal cello of Solano Community Symphony from 1988 to 1999, principal cello of the Sacramento’s Camellia Symphony from 2000 to 2002, and section cello for Stockton Symphony and North Bay Symphony, among others. He arranges and composes custom repertoire for the group. Anne Millington began her cello studies with Jean Maguire Mitchell in the San Francisco Bay Area, continuing with Burke Schuchman and Andrew Luchansky in Sacramento. She practiced veterinary medicine in the Bay Area till 1995 and is now Geographic Information Systems Coordinator with the California Department of Public Health. Anne and Steve’s time and money sink (besides day jobs and music) is a small set of large, friendly horses, a handful of wonderful cats, a nice yard, and some interesting cars. A number of local musicians make up our professional ensembles, including area friends, professionals and students from CSUS, UOP,and UC Davis. In addition to playing in any string configuration from solo to string orchestra, we also work with brass and wind players, as well as singers, and can provide you with recommendations for your particular needs.